Persistence Market Research (PMR) analyzes the global synthetic rope market in its new publication titled “Synthetic Rope Market: Global Industry Analysis and Forecast, 2018–2026”. This study provides data for 2017 along with the forecast for the period 2018–2026. The main objective of the report is to identify the dynamics in the market and provide recent updates and insights pertaining to various segments of the global synthetic rope market. To provide a better understanding of the synthetic rope market, the report also includes analysis of drivers, restraints & trends which influence the current market scenario and are expected to impact the global synthetic rope market over the forecast period. The study of synthetic rope provides data for 2017 along with a comprehensive market forecast for the period 2018–2026. To understand and assess market opportunities and trends, the global synthetic rope market report is categorically split into different sections based on material type, application and regions. The report starts with the market overview and provides market definition and taxonomy along with value chain, drivers, supply demand scenario & pricing analysis pertaining to the market. The sections that follow include global synthetic rope market analysis – by material type, application and regional/country level analysis. All the above sections evaluate the synthetic rope market on the basis of various factors affecting on the market. Each section discusses the qualitative and quantitative aspects of the global synthetic rope market. To give a brief idea about revenue opportunities from end-use sectors, delivery form and region/country-wise segments, the synthetic rope market report also provides market value (US$ Mn) data, growth rates, market shares and total incremental $ opportunity indices for each segment over the forecast period (2018-2026). In the final section of the report, we have provided a detailed competition landscape with company market shares and performance, to provide the report audiences with a dashboard view of key players operating in the synthetic rope market along with their business strategies. This would enable clients to assess strategies deployed by market leaders and help them develop effective strategies accordingly. For market data analysis, we have considered 2017 as the base year, with market numbers estimated for 2018 and forecast made for 2018–2026. The report considers the market size of the synthetic rope market at a global level and splits & evaluates the market at a regional level. The forecast assesses the total revenue (US$ Mn) of the synthetic rope market. In order to provide an accurate forecast, we have started by sizing up the current market, which forms the basis of how the synthetic rope market is expected to develop in the future. The critical market data, including the base number and segment splits, has been devised through in-depth secondary research. This data was then triangulated on the basis of different verticals, considering both supply side and demand side drivers and other dynamics of the various regional markets, along with primary interviews of synthetic rope manufacturers, distributors & suppliers and industry experts operating in the global synthetic rope market. The forecast presented in the report evaluates the actual market size (US$ Mn) in 2018 with regard to synthetic rope market and the expected market value in the global synthetic rope market over the forecast period. 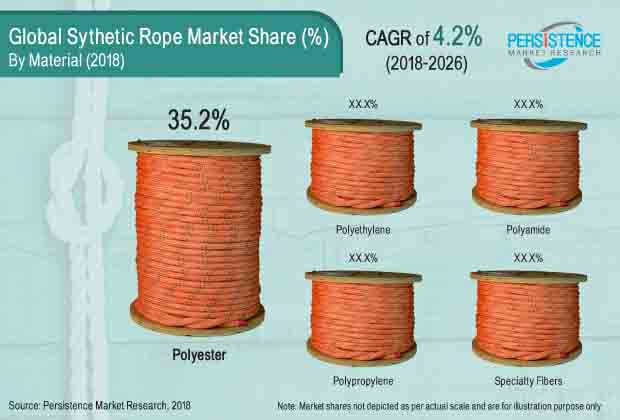 We have also analyzed the different segments of the synthetic rope market in terms of basis point share (BPS) to understand individual segments’ relative contribution to market growth. This detailed level of information is important for identifying the various key trends governing the global synthetic rope market. The report also analyses the synthetic rope market based on incremental dollar opportunity & the global absolute dollar opportunity. This is usually overlooked while estimating the synthetic rope market forecast. However, from a business development perspective, it is essential to identify that market attractiveness in terms of three indices: market share index, CAGR index and incremental dollar opportunity index. Moreover, the market attractiveness index allows clients to understand the key segments in terms of their performance and growth in the global synthetic rope market. This market attractiveness index would also help clients to identify real market opportunities in the global synthetic rope market. A synthetic rope is a bundle of flexible synthetic fibers that are braided or twisted together to enhance its length and tensile strength. Synthetic ropes are made of synthetic fibers, such as nylon, polyester, polyethylene and polypropylene, among others. Generally, synthetic ropes are manufactured using different types of fibers, such as multifilament, staple fibers or fiber films. Various beneficial properties offered by synthetic ropes are their high strength, durability, light weight and corrosion resistance. Due to these distinguishing characteristics of synthetic ropes, they are mostly preferred over steel ropes. Synthetic ropes find numerous applications in various end-use industries, such as marine and fishing, oil and gas, construction, among others. The global Synthetic Rope market is estimated to be pegged at around US$ 1,548.7 million in 2018 and is expected to register a CAGR of 4.2% over the forecast period (2018–2026). The global population is expected to reach 9 Bn by the end of 2050. With this significant growth in world’s population, concerns pertaining to food security and nutrition are becoming a vital issue in developing and developed regions. For the same, fisheries and aquaculture sectors are channelizing efforts to cater to the growing demand for food and related non-food products. According to the Food and Agriculture Organization of the United Nations, the global fish production was around 171 Mn tons in 2016. Of this, around 88% share was used for direct or indirect human consumption, wherein 47% was accounted by aquaculture production and 53% came from capture production. With this significant rise in consumption and demand for fish products, the fishing industry is expected to grow steadily over the forecast period. Synthetic fibers are an indispensable part of the fishing industry and are prominently used in fishing nets, twines and ropes. Synthetic ropes are used in trawling applications as they offer several benefits, such as better abrasion resistance, high breaking strength, high strength to weight ratio and better grip and light weight, among others. Owing to these factors, the demand for synthetic ropes is expected to increase at a fast pace during the forecast period. Moreover, the maritime transport sector has registered moderate growth since the economic downturn of 2008-09. The global shipping industry constituted over 85% of world trade, which includes trade of oil & gas, main bulks and dry cargo. According to UNCTAD, the global seaborne trade increased by 2.6% in 2016, in terms of volume, and is expected to grow at a CAGR of 3.2% over the period 2017-2022. With the growth in seaborne trade and increasing size of cargo, the demand for high performance, lightweight, cost-effective and safer ropes is increasing for mooring lines, tow line and lifting operations. Thus, the significant growth of the shipping industry and seaborne trade will in turn help to drive the demand for synthetic ropes over the forecast period. From a regional perspective, the Synthetic Rope market in North America is projected to witness relatively significant growth and is likely to maintain its dominance in the global Synthetic Rope market over the forecast period. Moreover, the China Synthetic Rope market is projected to represent significant incremental opportunity between 2018 and 2026. This is mainly attributed to significant growth of end use industries, such as shipping and fishing industry, in the country. South East Asia and Pacific Synthetic Rope market, on the other hand, is estimated to expand at a healthy CAGR, in terms of value and volume, over the forecast period. Some of the players reported in this study on the global Synthetic Rope market are WireCo WorldGroup Inc., English Braids Limited, Samson Rope Technologies Inc., Teufelberger Holding AG, Lanex AS, Axiom Cordages Limited., Touwfabriek Langman BV, Yale Cordage Inc., Bexco NV-SA., Atlantic Braids Ltd., Unirope Ltd., Dong Yang Rope Mfg. Co., Ltd., Cortland Limited and others. Synthetic ropes manufacturers have been channelizing efforts towards strengthening their production capacity volumes and are focusing on specific regions to cater to regional markets. This is expected to positively impact the synthetic rope market in near future. Dong Yang Rope Mfg. Co., Ltd.